Early FAFSA, with its “prior-prior year” (PPY) and potential C Code 399 issues, were hot topics at the 2016 National Association of Student Financial Aid Administrators (NASFAA) conference. It was enough to make Jennifer Buckles hear early storm-warning alerts in her head. The Director of Financial Aid at The University of Tennessee at Chattanooga (UTC) knew her staff of 17 was in for trouble if she couldn’t figure out how best to handle the forecasted deluge of uncertainty, confusion, and upset students who would likely be asked to jump through more hoops—and/or potentially lose the financial aid they were counting on. The transition to early FAFSA and PPY has created a perfect storm of unintended consequences that will last exactly one year—and potentially hit returning students the hardest. It’s a one-time situation in which two aid years (2016‑17 and 2017‑18) will use income tax return information from 2015. A new Comment Code 399 is generated that requires schools to compare that two-year-old income data if it doesn’t jibe with information previously filed by the student. The Department of Education flags the application, but it’s up to the school to determine if the flag is valid, make the needed corrections, and adjust the amount of aid awarded to the student based on updated income information. Financial Aid professionals agree that the idea behind early FAFSA is a good one—streamlining access to college by accepting aid applications as early as October, rather than January, and allowing applicants to use “prior-prior year” income tax returns to do so. The expectation is that early notification of aid awards will compel more students with financial need to enroll in college. Bolstered by her chancellor’s focus on serving students, while also seeking shelter from the forecasted conflicting-information storm, Buckles sat in on a CampusLogic presentation during that fateful NASFAA conference. She learned that CampusLogic could bring big benefits to her students. The financial aid software suite—specifically StudentFormsSM and AwardLetterSM—would help UTC streamline the FinAid application process, ensure aid was awarded efficiently, and positively impact retention. Even better for her short-term concerns was the new 399 Workbench—a feature added to StudentForms specifically for clearing 399 flags during this transitional year of early FAFSA. “It wasn’t a hard sell” when she returned to campus, she says. “We all knew this was the way to keep our students and staff happy—and our processes compliant.” Buckles recently shared her experiences with early FAFSA issues in a WebClinic. Last October, well before full functionality of the CampusLogic platform was live at UT-Chattanooga, Buckles’ team was uploading ISIRs. By early December, she reports, “we were up to our ears in 399s.” That’s when her FinAid office experienced the immediate value of 399 Workbench. Automatically creating a queue of 399-flagged files for review and resolution. Employing a single page for comparisons between conflicting information. Highlighting the actual conflicting information (no more needle-in-a-haystack!). Enabling easy, personalized text/sms notifications to notify students that additional information is needed. Truly helping FinAid offices serve students. For most of the nearly 11,000 students at UTC, financial aid awards will not be affected, Buckles notes. But by minimizing time spent on the anticipated 2% of applications that will be flagged with C Code 399, her staff can now spend more time counseling and assisting students who need extra support. 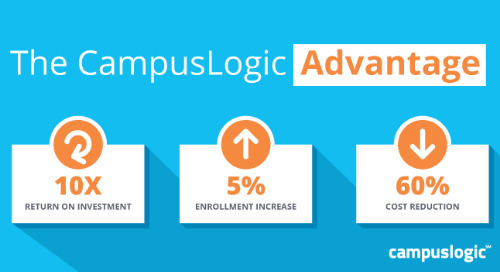 Seeking to support an ‘unprecedented enrollment surge,’ the UCSB Assistant Vice Chancellor for Enrollment Services tapped CampusLogic. He's never looked back. "If you're like me, the idea of advocating in D.C. is nerve-racking. As a perfectionist—like many FinAid pros—it’s hard to enter situations with so many unknowns." VP Amy Glynn has 5 tips for success. Our January WebClinic presented by Jennifer Buckles, Director of Financial Aid at UTC-Chattanooga "How to Clear C Code 399 Flags and STILL Have a Life" demonstrated the power of 399 Workbench. Sonia Slomba, Director of Financial Aid at Central State University, talks about accessibility and the school’s commitment to helping students explore funding sources to make informed decisions. Constantly being asked to do more with less? Trying to drive enrollment yield, student engagement, and completion rates? See how our platform helps bridge the gap between Enrollment and Financial Aid. You need new technology, but money is tight. Tips to help you conquer the anxiety, build your business case, and tell a story that everyone on your campus can get behind. As schools look for ways to stay relevant and profitable, many state systems are making the move to consolidation. VP Amy Glynn offers tips for personalized student engagement that scales easily. Frustrated by how much work it takes to get scholarship applications to the right reviewers—and managing those reviewers? This webinar is for you.